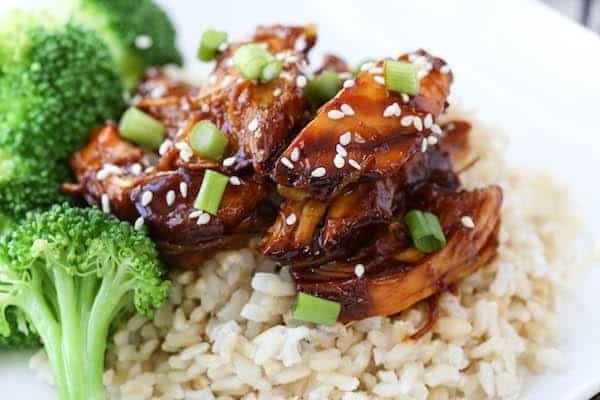 Boneless skinless chicken breasts and homemade teriyaki sauce served over rice or quinoa make this crock pot teriyaki chicken a perfect weeknight meal. Hey Rachel Cooks readers! 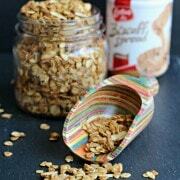 Taylor here again from greens & chocolate with another slow cooker recipe. After a decadent chocolate fondue recipe last month, I figured we could use a healthier meal to sustain us through March. Better yet, a quick and easy meal! While I love to throw pork shoulder or beef roast in the slow cooker, I always hesitate with what to do to chicken breasts. One of my frustrations with a lot of chicken recipes for the crock pot is that so many of them contain cans of condensed soup. I’m okay with cutting some corners occasionally, but most of the time I like a clean and healthy meal for dinner if I’m cooking at home. 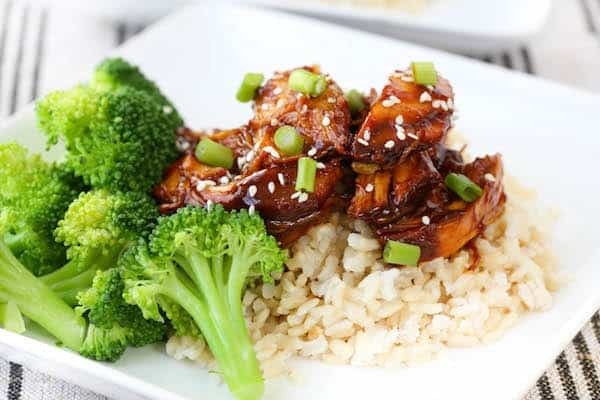 I have my stand-by chicken dishes for the slow cooker, but I wanted to switch things up a bit, which is how I came up with this Crock Pot Teriyaki Chicken. An at-home Chinese take-out favorite?! Yes, please! This recipe could not be easier to throw in the slow cooker before rushing out the door in the morning. 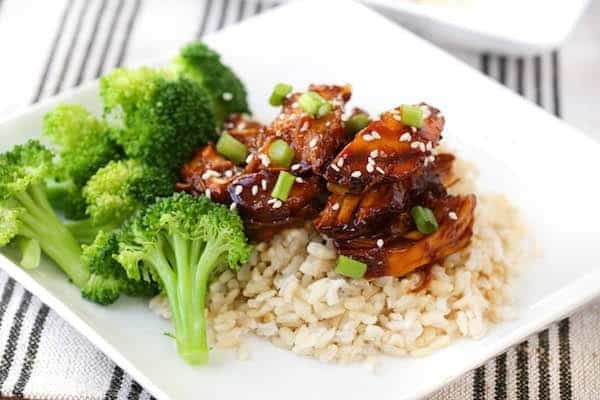 The teriyaki sauce is a simple mixture of soy sauce, honey, brown sugar, garlic, and apple cider vinegar, which is poured over the chicken to cook in all day. Since we’re cooking chicken breasts, this recipe will come together a bit more quickly than a pot roast, so all the time they need is 3-4 hours on high or 6-8 hours on low. Luckily, if you have a slow cooker that has a timer, this will be no problem if you’re gone all day. Once you are ready to eat, you simply shred the chicken breasts and then reduce the sauce over the stove with a bit of cornstarch and water to thicken it up. I served mine on top of brown rice topped with sesame seeds and green onions, but you could also use quinoa or couscous if you prefer. I also added a good helping of steamed broccoli as a side for some green on my plate. All in all, a healthy and delicious meal! Note from Rachel: I have this slow cooker and love it! Can I use chicken thighs, chicken wings or chicken legs instead of breasts? 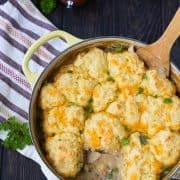 Can I use this recipe with bottled sauce? Of course, if you’re in a pinch, that will definitely work. 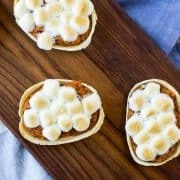 But you probably have all the ingredients for the homemade version, and you’ll love the flavor! What do I serve with Crock Pot Teriyaki Chicken? Anything you want! But we love it with brown rice or quinoa and a vegetable. Broccoli is a classic choice but you could use any combination of vegetables your family loves. 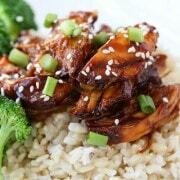 Watch this short video to see how to make this Crock Pot Teriyaki Chicken! Place chicken breasts on bottom of slow cooker. Combine soy sauce, vinegar, honey, brown sugar, and garlic in a small bowl or measuring cup. Cook on high setting for 3-4 hours or 6-8 hours on low setting, until chicken breasts are tender. Remove chicken from slow cooker and shred with forks. Set aside. Pour sauce into small saucepan. Combine cornstarch with water, and add to sauce. Over medium heat, bring sauce to a low boil, stirring often, and cook another minute, until sauce is thickened. Pour thickened sauce over shredded chicken. Serve over rice or quinoa, topped with sesame seeds and sliced green onions. Nutrition information does not include rice, quinoa, or garnishes. Looking for more quick and easy slow cooker meals? Check out Rachel Cooks’ entire slow cooker recipe collection, including a list of 100 slow cooker recipes. 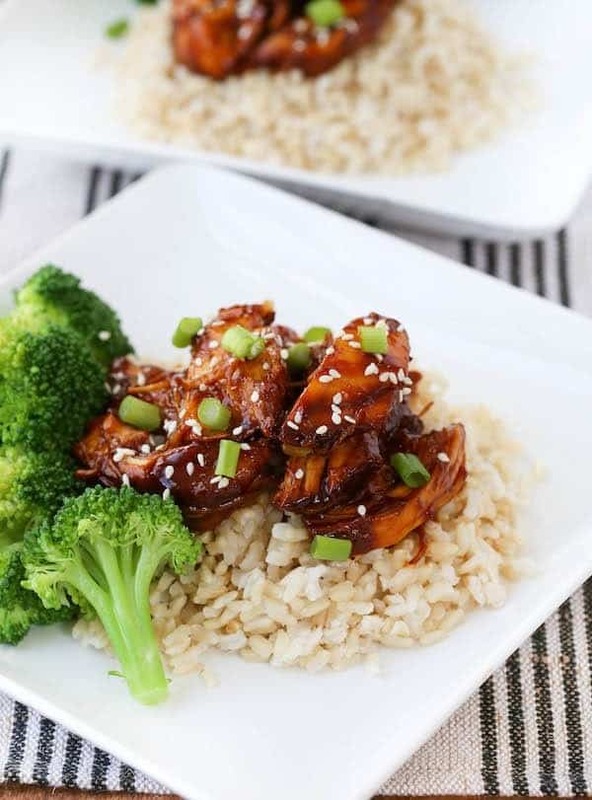 Comments Off on Crock Pot Teriyaki Chicken Recipe – with video!